My research is aimed on identifying new methods of data analysis that leverages domain knowledge and state-of-the-art statistical and machine learning methods to have more sensitive and informative tools to do science. 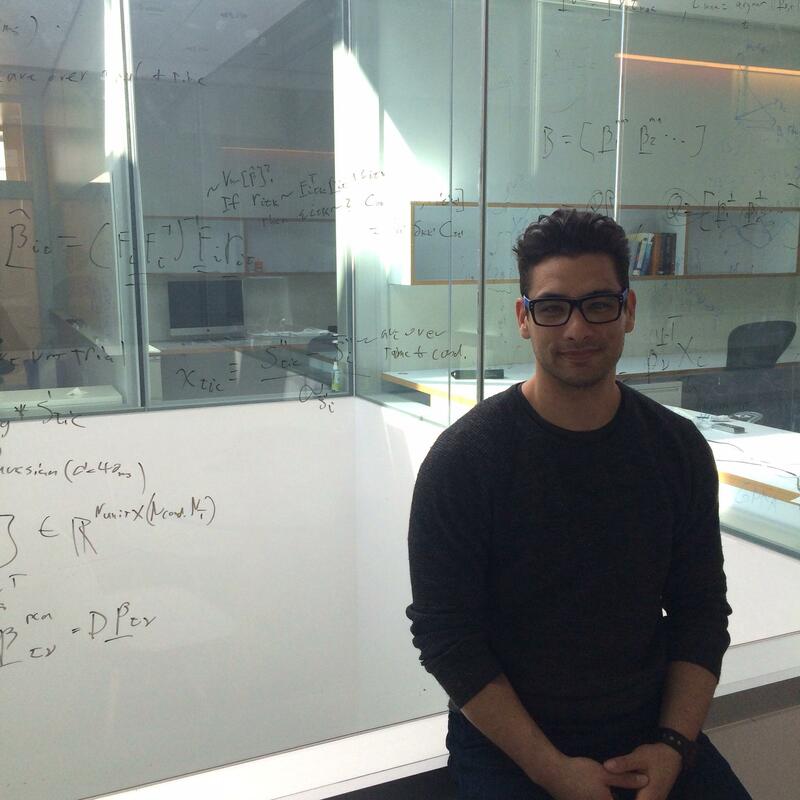 I am currently a postdoc in the lab of Jonathan Pillow where I am working on problems involving large-scale Bayesian nonparametric inference, Bayesian optimization, and modeling and dimensionality reduction for neuronal population dynamics. I did my graduate work with Mette Olufsen at North Carolina State University on modeling and analysis of cerebral autoregulation. I used a biophysical model to summarize the interactions between physical and regulatory parameters, and used this model in concert with clinical data to asses cerebral autoregulatory function in people suffering from chronic ischemic stroke. Afterwards, I worked with Uri Eden and Mark Kramer developing metrics for the analysis of rhythmic phenomena in neural systems. We identified how small deviations from underlying assumptions influence metrics of oscillatory synchrony in point process data, and suggested analysis methods that might behave more favorably. I also worked in collaboration with Tim Gardner developing spectral anlaysis tools for instantaneous frequency estimation using time-frequency representations. Here are a few projects that I'm currently working on. Please feel free to contact me if you have any interest in these projects. Aoi MC, Mante V and JW Pillow. Prefrontal cortex exhibits multi-dimensional dynamic encoding during decision-making Recent work has suggested that prefrontal cortex (PFC) plays a critical role in context-dependent perceptual decision-making. However, individual neurons in PFC exhibit heterogeneous tuning and diverse temporal response profiles, making it difficult to characterize population-level coding of information. Here we attack this problem using a new method for identifying the dimensions of population activity that carry task-related information. Our analysis reveals that monkey PFC has a multidimensional code for decisions, context, and relevant as well as irrelevant stimulus information during decision-making. These representations are not static, but consist of activity patterns that evolve through time with rotational dynamics. This view of PFC encoding demonstrates on-going encoding of stimuli, in contrast to transient PFC encoding reported previously. We perform model-based decoding of PFC activity, and show that the optimal readout rule is time-dependent, allowing for simultaneous extraction of context, stimulus, and information for an upcoming decision. Check out some (Supplementary Movies) of these multidimensional trajectories over time. We also have some demo code you can use on your own data. Everything is in beta so let me know if you have questions. Mikio C. Aoi, Benjamin B. Scott, Christine M. Constantinople, Carlos D. Brody, & Jonathan W. Pillow. The following code is meant to supplement some of the methods that I've developed. It comes with no guarantees and I consider everything in beta in perpetuity. That said, feel free to contact me if you have any trouble or questions implementing anything. This code will perform the rate adjustment to spike-field coherence that is described in my paper on the subject. It includes a demo of the functions using simulated data. 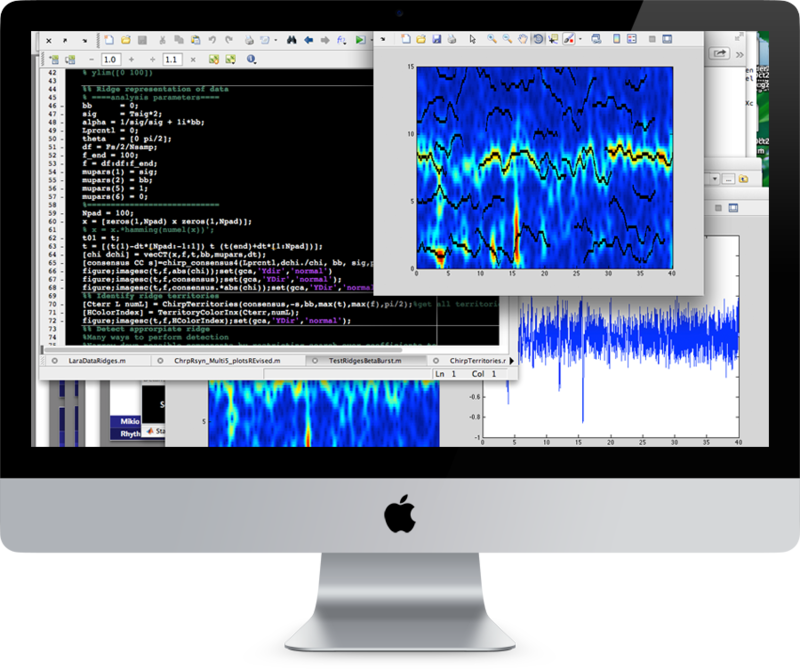 For code implementing our GLM approach to measuring rhythmic spike-field coupling, see the webpage of Kyle Lepage. This code is for implementing a method for estimating scalable Bayesian receptive fields. Demo code for targeted, linear dimensionality reduction (TLDR). Some cool movies of low-D trajectories of neural activity from PFC using our new dimensionality reduction method. Aoi MC and JW Pillow. Scalable Bayesian inference for high-dimensional neural receptive fields. Shvartsman M, Sundaram N, Aoi MC, Charles AS, Wilke TC, and JD Cohen. Matrix-normal models for fMRI analysis. Stanley DA, Roy JE, Aoi MC, Kopell NJ, and EK Miller. A Low-Beta Oscillations Turn Up the Gain During Category Judgments. Aoi MC, Lepage KQ, Kramer MA and UT Eden. A Rate-adjusted spike–LFP coherence comparisons from spike-train statistics. Aoi MC, Lepage KQ, Lim Y, Eden UT and TJ Gardner. An Approach to Time-Frequency Analysis With Ridges of the Continuous Chirplet Transform. Lepage KQ, Gregoriou GG, Kramer MA, Aoi MC, Gotts SJ, Eden UT and R Desimone. A procedure for testing across-condition rhythmic spike-field association change. Aoi MC, Hu K, Lo M-T, Selim M, Olufsen MS and V Novak. Impaired Cerebral Autoregulation Is Associated with Brain Atrophy and Worse Functional Status in Chronic Ischemic Stroke. Aoi MC, Matzuka BJ and MS Olufsen. Toward online, noninvasive, nonlinear assessment of cerebral autoregulation. Interspecific and intragenic differences in codon usage bias among vertebrate myosin heavy-chain genes. Fill out the form to the right and hit Send Message!